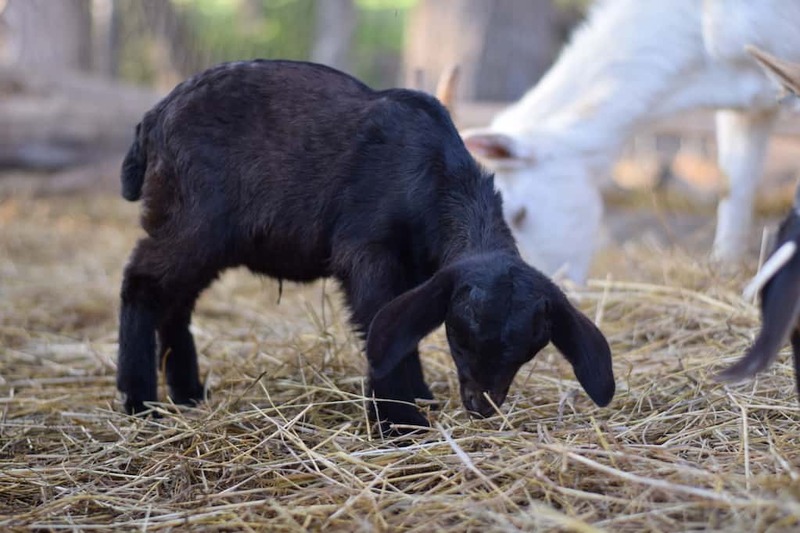 You are here: Home / blog / The Essential Baby Goat Care Info You Need to Know! It’s kidding season for us, one of the best times of the year! I love when our homestead is filled with tons of adorable baby goats. This year we have 18 mama goats who are expecting and things can get a little hectic. We try to allow nature takes its course, allowing the mamas to kid on their own and only get involved or intervene when they need the help. So the process tends to get a little hectic because we have to monitor and check on their progress. This includes checking them in the middle of the night. Our first kidding we didn’t plan things too well. And at least this year, I’m not 8 1/2 months pregnant. I was miserable and had to waddle all the way to the goat barn in the middle of winter. But seriously, I’m not gonna lie here. It was downright rough. Do I still sound a little bitter? Maybe a little bit, but the baby goats were just too adorable that I got over it. 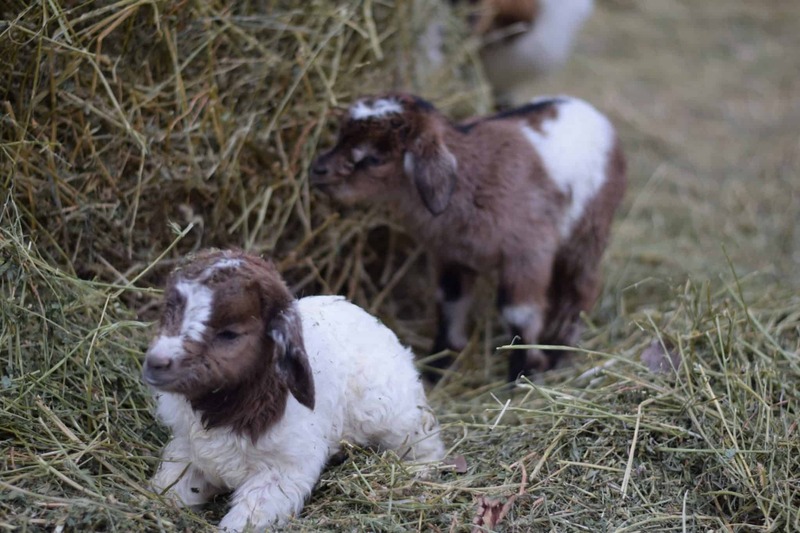 The first steps to getting prepared to welcome new baby goats are to know what to expect. Some of the first signs that your doe is about to kid are if you notice her being distant or acting “off”. Sometimes ours will go into the goat barn alone to hide from the others or to seek privacy. Contractions and arching of her back. 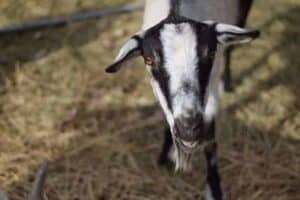 The more you are around your goats and learn their behaviors, the easier the signs are to spot. Some of the time, kidding doesn’t go as we would have hoped or planned. Sometimes the baby goats don’t make it. And as much as I would like to say, this never gets any easier. Some other times, you may need to intervene and help a mama goat kid. Just last night my husband had to pull a goat. And unfortunately the baby didn’t survive. It came out backwards and it was beyond saving at that point. Also its important to know that you should allow your goats the space they need to kid, but also need to check on them regularly during this process. This means regular checks through out the day and in the middle of the night. Be prepared for some late nights. TIP: keep your veterinarian’s phone number handy or on your speed dial during this time and in case of an emergency. I know a lot of people tend to create a kidding kit or suggest a lot of things for the process. I believe that it’s always best to be prepared. We try to keep things simple and keep what we feel are the essentials because goats don’t require a lot of extra supplies. We allow the mama goats to run the show and kid on her own. So most of these items are used for when we need to intervene. Disposable gloves, extra-long gloves are helpful for when you need to help pull a kid. Colostrum supplement or some that is frozen from previous goats who may have lost a baby is helpful. We milk the mother goat and bottle feed whenever a baby isn’t nursing or in other cases, such as having multiples born to one doe. We also make this electrolyte for a weak baby. Mix well and drench or allow the goat to drink from bottle. If the kids are staying with mama, there really ins’t too much that you’ll need to do. We allow the mama time to bond with her newborn – this is extremely important. Normally, a doe will clean off her baby on her own and there isn’t a need for us to get involved. But sometimes, there may be a situation arise where we need to help a mama out. This is where those old blanket and towels come into play. TIP: I like to stock up on towels and fleece blankets that go on clearance for ultra cheap, and then I’ll store them in a tote until needed for kidding season. Naturally the umbilical cord will tear during the birth process and can vary in length. Always allow the cord to tear between mother and baby naturally. After it’s torn, if you’d prefer, you can trip it to about 2 inches by using scissors. This isn’t necessary and we don’t typically do this, but prefer that extra protection. Once cut, dip it in 7% iodine solution. This helps prevent infection as well as to dry the cord. Another thing we like to do is periodically monitor the mama and the new kids to check how they’re interaction together and ensure there are no complications or birth defects/issues. Ensure they have clean, dry and warm bedding. 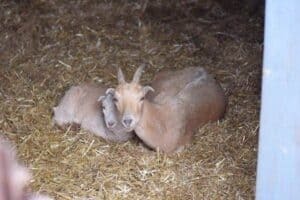 During the extreme cold of winter, we provide our baby goats with a heat lamp. But only in those sub zero temperature days. It is extremely important to ensure safety when using heat lamps. 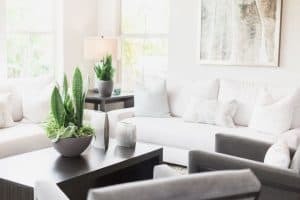 Double and maybe even triple check that you’re using a proper bulb for your heat lamp and that you have the proper cords in place. Alternating them on occasion is also something that I like to do to ensure they aren’t running continuously. Sometime after the birth, the doe will pass her placenta. Make sure that you allow the mama time to eat it. You may dispose of any that she does not eat after giving her adequate time. The kid should be able to nurse from the doe within an hour or so. It is extremely important for the baby to get that healthy colostrum. This needs to be done within the first 24 hours for it to receive those essential antibodies. The sooner, the better. We generally offer hay and some grain, in very small amounts for the baby goats when we are trying to encourage natural weaning. But we also make it available early on to start rumen development (usually sometime after a week old). 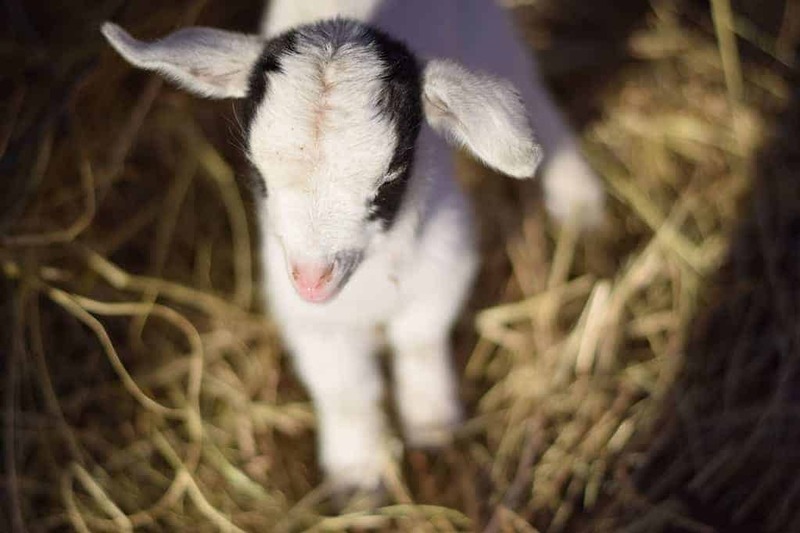 A baby goat can be weaned when it’s doubled in weight since birth. Generally, we wean after 3 months. If you need to bottle feed your goat, ensure that it is fed small amounts of milk frequently. Usually about four times a day within the first 30 days. This helps prevent digestive issues and mimics the natural feeding of nursing goats. After the 30 days, you can reduce the number of daily feedings to 3 and can start transitioning to milk buckets as they grow and then on to weaning once ready. Within the first week, Clostridium and Tetanus vaccinations should be administered. My husband is well skilled in administering vaccinations, so he takes care of all of this. If in doubt or you’re not experienced in this area, check with your veterinarian. 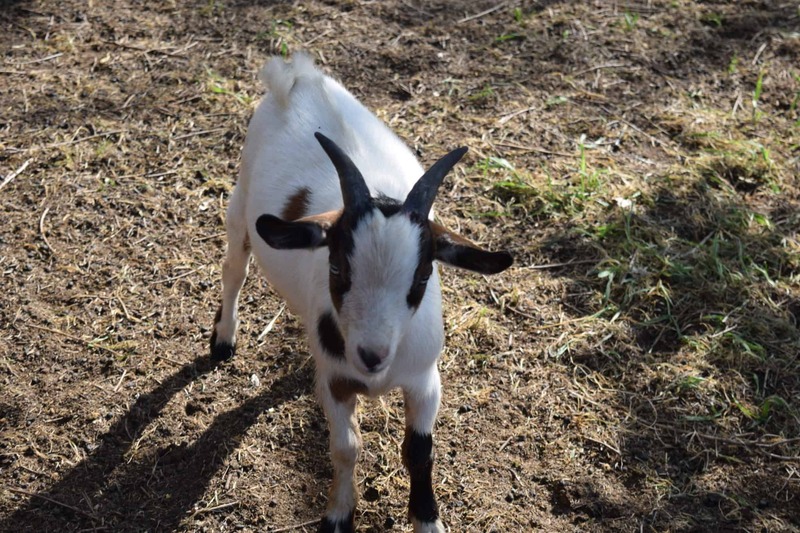 Baby goat care is very simple and taking the necessary steps, helps to provide a great and healthy start to your kid. Its totally worth the little extra work. i need to make milk re placer for baby goat, composed of powder of dura , molasses ,salt, water .is it possible to do this? 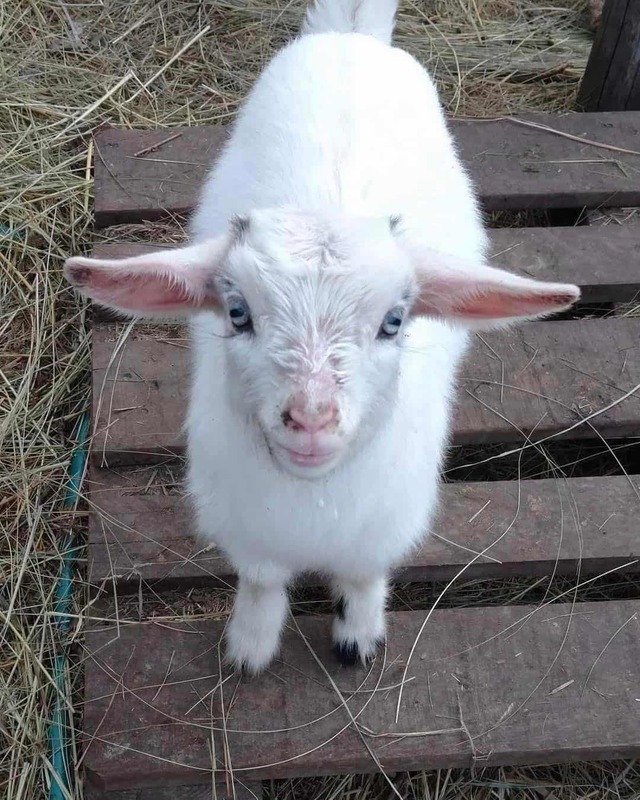 I have just became a goat mamma- I was given a 5 day old goat and am learning very quickly- I guess I worry and I know I shouldn’t but I am used to calves not goats- when can u start to keep baby goats outside? 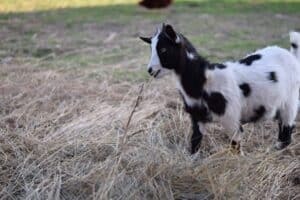 We just adopted 2 Nigerian Dwarf goats. The male, Kiss, is 3 months and the female, Pepa is a month. We are bottle feeding Pepa and supplemented with sweet treat. I noticed today that she seems to be bloated. She is very active so not feeling bad. i have seen her urinate and poop. Should Is be concerned?